Note that the manuscript should be uploaded as one file with tables and figures included. This file can be a Word document, a PDF, or an embedded or zip file (.rar) if separate high resolution figures or a supplemental file such as a video are also to be included with the submission (the file size maximum for a video is 25MB). If the video is too large to submit, please contact kca@iospress.com to arrange a file transfer. For further information, see “Supplementary Data” below. Resubmissions should include the manuscript number in the cover letter. Resubmissions should clearly mention that the submission is a revision and include the reference number in the submission letter. The author's replies to the reviewer comments should be included in the revised manuscript itself (at the top). The revised paper should always be a Word document. Manuscripts not revised within 6 months of first submission will generally be considered as new submissions and re-refereed accordingly. Submission of an article is understood to imply that the article is original and unpublished and is not being considered for publication elsewhere. 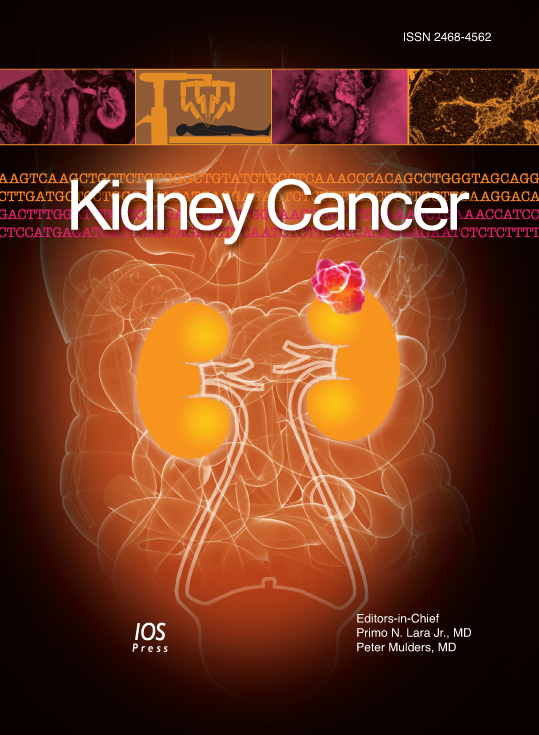 Kidney Cancer is committed to the highest ethical standards and best practices in publishing and follows the code of conduct for Committee On Publication Ethics/DOAI and the ICMJE. Any possible conflict of interest, financial or otherwise, related to the submitted work must be clearly indicated in the manuscript. Procedures involving experiments on human subjects should be in accord with the ethical standards of the Committee on Human Experimentation of the institution in which the experiments were done or in accord with the Helsinki Declaration of 1975. Procedures involving experimentation on animal subjects should be in accord with either the guide of the institution in which the experiments were done, or with the National Research Council’s guide for the care and use of laboratory animals. The abstract should make clear the context and aims for the study. It should also state how it was conducted, the main findings and conclusions drawn. Clinical trial abstracts should include items deemed essential by the CONSORT group. There is no word limit to the materials and methods section, as the journal’s policy is that methodological rigour and reproducibility is of great importance. This section should aim to be sufficiently detailed to enable others with access to the data to reproduce the results. This should link the conclusions with the aims of the study but avoid overinterpreting the study’s findings. Figures should be designed with the format of KCA in mind and preferable sized as they will appear when printed. A single column of the journal is 77mm and two columns are 165mm. Reviews should be authoritative and topical and provide comprehensive and balanced coverage of a timely and/or controversial issue.Reviews should be prepared as detailed above for a Research Report omitting Introduction through Discussion, and include a Conclusion. When submitting a Review, clearly signify the article as such in the submission title by using: "REVIEW: full article title". All affiliations with or financial involvement (e.g., employment, consultancies, honoraria, stock ownership or options, expert testimony, grants or patents received or pending, royalties) with any organization or entity, independent of relevance to the particular manuscript, are completely disclosed in the letter of submission. Statement of all financial and material support, independent of relevance to the particular manuscript, and any potential conflicts should also be clearly identified in the Acknowledgment and Conflict of Interest sections. If there is no Conflict-of-Interest then still add this statement. All financial and material support are clearly identified in the manuscript, including listing of support specified in the letter of submission.